My latest New Forest Finest Silvertip is going to be delayed due to continuing problems in finding an ink that will improve the durability of the logo. Although I have no complaints about the logo on my first brush, the 2201, it does come off too easily for my liking. I know this is a problem with other brush logos but I want to get mine right. So I have agreed to a further delay in the search for better ink. I'm surprised that the manufacturer doesn't have other clients as fussy! Meanwhile, I have been working on a locally made New Forest brush with my craftsman. I intend to have a few made to assess the demand and reaction. This is a prototype. It is made from tambootie, an African hardwood. It has the same two band hair used in my Superior Badger 2201. The handle height is 51 mm, loft 51 mm and knot width is 22 mm. A good backbone will make it a superb all round brush for use with soaps and creams. One of the delights about having your own blog is that you cannot break any rules or conventions about listing items for sale. If anyone reading this blog is interested I'll deliver this specific brush anywhere for £35. A genuine, hand made in the New Forest, England, shaving brush. It's the first New Forest 2202 - the reference I will use for tambootie handle brushes of this size. I had five of these brushes made. They all sold after people contacted me after seeing the above. I'll be assessing feedback before making any more. If I do, I will update this post. I have one of these brushes and despite owning others it is my daily go to brush. I like the slightly scrubby nature of the knot that this has and it works brilliantly with creams and hard soaps for face lathering. 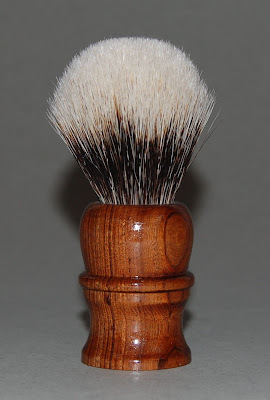 2015 - and this brush is still performing brilliantly Fido- some slight "weathering" of the handle, which is to be expected with wood and adds to its charm. Aside from that the brush has fared well and is used often with both hard soaps and with creams. I have switched to bowl lathering recently however.